Despite what some may try to tell you, the flu isn’t a disease that should be taken lightly when it comes to preventative action. So many opt out on getting their flu shot each year, but with new strains appearing at a rapid pace, it’s not worth the risk. Here are three important steps to take this flu season to help keep your immune system at its best. 1. Make time to get the vaccine. This is going to be the best option when it comes to prevention. There are different types of flu viruses, but the vaccine will help decrease your chances of getting the strains that are most common. Those who are 6 months and older should get the vaccine every year before the season begins (it is recommended to be vaccinated by the end of October). If your child is younger than 6 months, they cannot receive the vaccine; however, it is important that you do. If you’re a high-risk individual, you simply cannot afford to miss out on a vaccine (young children, those who are 65+, pregnant women, those with asthma, diabetes, and those with heart and/or lung disease). If you work in a healthcare environment, it is of the utmost importance to get your vaccine since chances are you will be exposed to someone who is sick during the season. 2. Try not to spread germs. This can be difficult, but try to limit your interactions with those who are sick. If you yourself are sick, isolate yourself from others while contagious. 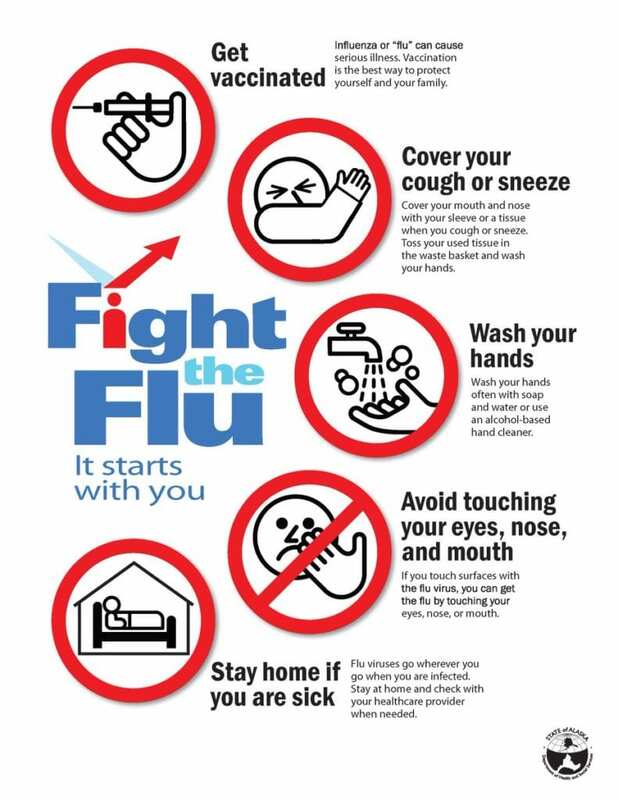 If you believe you have the flu, stay at home for at least 24 hours until your fever is gone, unless you need to visit your doctor. While coughing and/or sneezing, cover your mouth; toss any used tissues in the trash immediately and then disinfect any surfaces or objects that may have germs on them. Wash your hands throughout the day with soap and water; if none are available, use a hand rub that is alcohol based. Refrain from touching your eyes, nose, and mouth; germs are typically spread this way. 3. Take all medications that are prescribed to you. If you have the flu, your doctor may prescribe antiviral drugs; these aren’t available over-the-counter like most antibiotics. Antivirals can weaken the illness, decrease the amount of time you are sick, and help prevent more serious flu complications. If you are a high-risk individual, an antiviral could be what keeps you out of the hospital while sick with the flu. These drugs work best when started two days into the illness, although taking them at a later time is still helpful. Follow your doctor’s instructions when taking these.